Customize your outdoor living experience with an Acucraft custom made fire pit, fireplace, or burner. Whether you’re looking to add a little fire to your backyard or commercial space Acucraft can customize an option to fit your needs. Our outdoor fire series includes both gas and wood burning options, linear and square, single sided and see through, as well as custom shape gas burners. Our outdoor burners are custom designed to fit your vision! They are built with 100% stainless steel components and are designed to be inserted into your non-combustible enclosure. Available in natural gas or propane, electronic or manual ignition, and optional water drainage. Our outdoor fireplaces are available in wood or gas (natural gas or propane) and are custom designed to fit your exact needs and specifications. They can be made single sided, see through, or indoor/outdoor with sealed viewing areas, open (no glass), or with operable doors. Choose from square, linear, or panoramic. Delivered fully assembled and designed to be finished with your specific materials – clad, stone, marble, tile, etc. 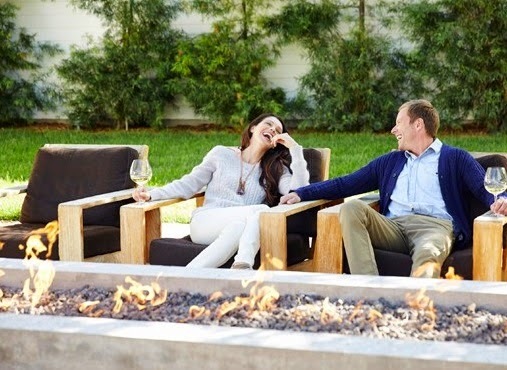 Acucraft’s custom outdoor fire pits come in square, linear, and custom sizes & configurations to fulfill your vision. Made with 100% stainless steel components, 1/2″ tempered safety glass, water drainage options available, choose from natural or propane gas, electronic or manual ignition, can be finished by Acucraft and arrive fully assembled, or can be designed ready to be finished with your specific materials – clad, stone, marble, tile, etc. Click here to view our Outdoor Fire Gallery. Request a copy of our Outdoor Fire brochure by clicking here. Many of our customers choose a Patina finish for it’s rustic antiquity and classic fireplace character. Patina is a process of changing the look of the steel through oxidation with the application of heat; it offers a more textured and weathered look while still providing you with an elegant appearance for your fireplace. Acucraft offers three different Patina finishes: Japanese Brown, Aged Bronze, and Copper. Our Japanese Brown Patina is the result of a 300 year old recipe used in Japan on cast iron tea pots, and is the most popular Patina finish for Acucraft. The Aged Bronze Patina offers a rich, smooth textured finish, giving your fireplace a more rustic appearance. Last, but certainly not least, is our Copper Patina which provides a more traditional greenish brown finish leaving you with a deep, aged appearance. The tone and depth of your Patina can be adjusted by the number of coats applied. Patina takes time and our team has worked diligently to perfect the process and deliver quality, aesthetically appealing finishes for all of our fireplaces. Acucraft sends out color samples of our Patina options (at no charge), but no two Patinas are exactly alike…that’s part of their beauty and what makes then so unique. Below is a short video which brings to life the Patina process and the craftsmanship involved. Our team begins preparing the steel by polishing the front of the fireplace to remove any scratches or imperfections.Then it is cleaned, degreased, and wiped down with hot water to ensure a clean surface. The Patina process then begins by heating the steel with a torch to eliminate all of the moisture on the surface, then the Patina solution is sprayed onto the front and heated with a torch; this process is repeated until the desired color has been achieved. Once the steel has cooled it is sealed with a clear coat to stop the oxidization process and lock-in the color. Our team of dedicated welders & fabricators provide us with the unparalleled expertise and integrity you look for. With over 35 years in the fireplace industry, Acucraft has become one of the nations leading fireplace manufacturers by offering innovative and unique solutions for our customers while offering outstanding customer service.. We stand behind all of our products and offer a lifetime warranty on every one of our custom and standard fireplaces. Our team of fireplace designers & engineers work directly with architects, builders, and designers to turn your dream fireplace into a reality. From single-sided to custom see-through fireplaces and outdoor gas burners, no fireplace is too big, no project too small. From whole home heating to show-stopping ambiance, we can design and manufacture it all! Click here to visit our Fireplace Gallery. Acucraft Fireplaces partnered with Cabela’s to design and build commercial custom gas fireplaces for their stores all across the nation. Cabela’s wanted to work with a manufacturer that could meet their specific requirements, including the ability to present several unique design options, create big flames, keep the glass very cool, and be able to supply them with fireplaces in stores worldwide. Acucraft developed a Cabela’s Team, stretching across all departments, from sales and design to fulfillment and technical support. The team works directly with each location’s builders, installers, and employees to be the sole point of contact for manufacturing their custom gas fireplace. Every Cabela’s location receives the same custom gas fireplace which allows our team to become experts on the product they’re delivering! With our on-site consultation services our designers are able to meet on-site with the Cabela’s chosen contractor to ensure proper installation and answer any questions they have to ensure proper installation. The storyboard seen above was part of a presentation given to Cabela’s that detailed many design options, including seven screen options, four patina finishes, and three steel hammered options.The design then went through a series of collaborative iterations. 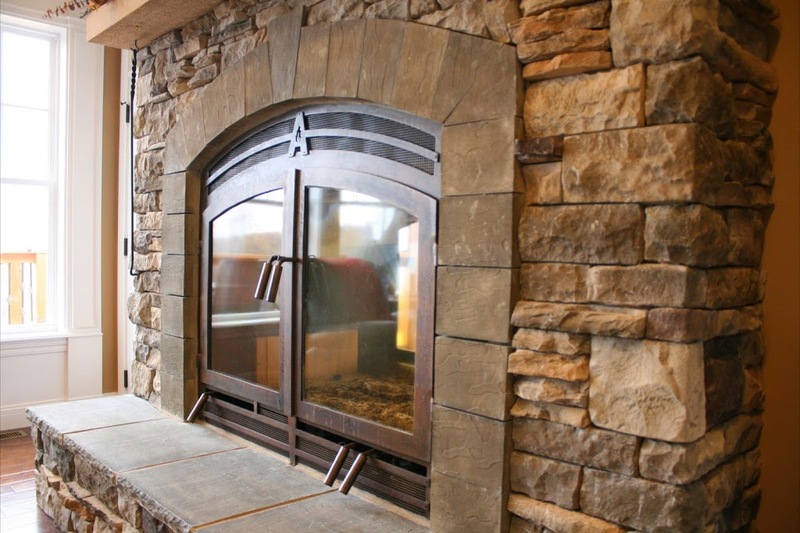 After receiving approval from Cabela’s, the fireplace entered the production and testing phases. All Acucraft fireplaces are handmade out of 7 GA steel and tested for precision prior to shipment. In addition to testing the flame size and ignition system, Acucraft ran a series of tests to ensure the glass would remain cool, below 140 degrees F. They also chose to implement Acucraft’s Patent Pending Glass Cooling System and optional fan delay system which runs cooling fans for 60 minutes after the fireplace is shut off to keep the glass at a lower, touchable temperature. The finished fireplace has a viewing area of 6′ wide by over 6′ tall with custom operable screen doors with a large flame coming through a 5′ (60″) mammoth logset delivering a perfect flame height with up to 260,000 BTUs! Special thank you to Cabela’s for their continued support. To view more of our Custom Gas Fireplace photos, click here. Request your copy of our New Custom Gas Brochure!